It’s not every day you turn one. Yesterday Melbourne childcare centre, River Garden celebrated its first birthday in style. 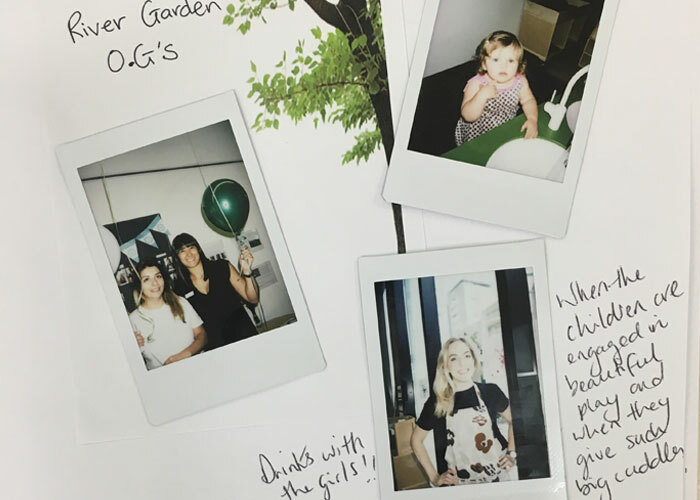 With cupcakes, balloons and a Polaroid memory book where families could write down their favourite River Garden memory, it was an exciting day in the life of the River Garden community. 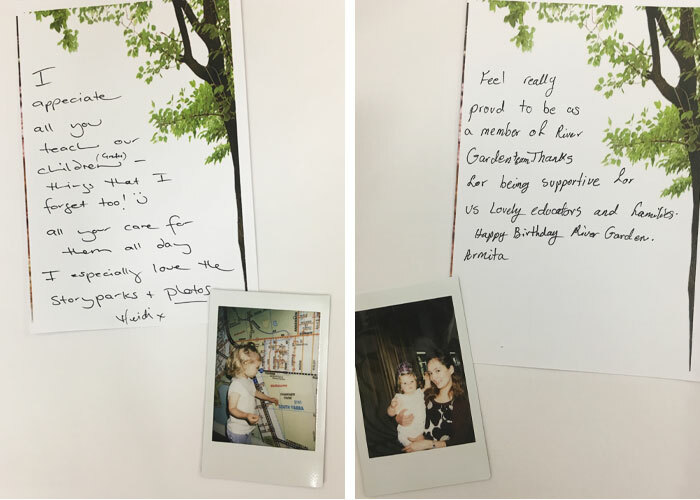 Birthday gifts were given to existing and touring families and children were a part of the experience too. The two and three year olds drew what River Garden means to them, older children decorated cakes and ventured into the park for a celebratory picnic and the younger children decorated “cakes” in the sandpit using pipe cleaners as candles. Some favourite River Garden moments from the past year. Birthday celebration artwork (left) and birthday notes from a family (right). River Garden’s ‘Out & About Program’ was a hit, not only with the children but also among the local community. The head-turning “octo-prams” seat eight children and could be seen on the streets of Melbourne exploring the local community and were even featured in the Herald Sun in early March. River Garden are looking forward to going on more excursions in the future. If you’re in Melbourne, keep an eye out! Over the year, the centre has built a great educator team with a mix of strong experienced educators to enthusiastic trainees, mentored and trained by colleagues who are gaining great experience on the job. 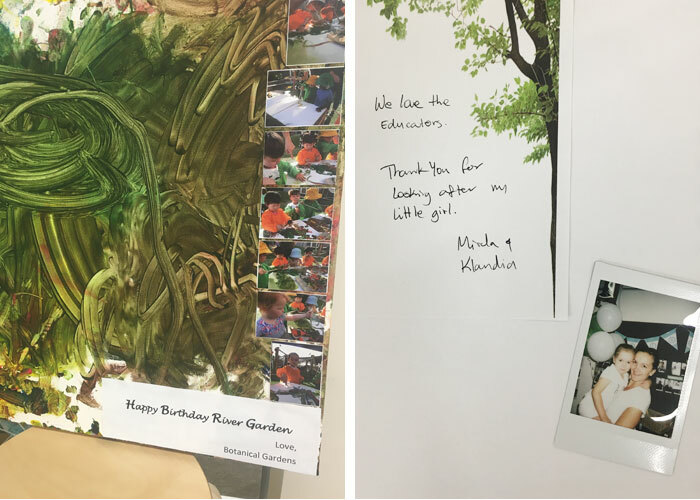 Building relationships with families and creating a strong sense of community was high on River Garden’s list of priorities in the first year. During this time they created a social committee which held meet and greet sessions, events and information nights for parents. These have proven valuable to both new and existing parents and helped them to feel a part of the family. As part of the centre’s community focus, extended family members were invited to the centre for Mother’s and Father’s Day morning teas. Here families were able to see the centre for themselves, enjoy delicious treats as well as have large family portraits taken in the centre. River Garden’s open space is not only beautiful but gives the centre a real community feel. It encourages multi-age interaction between the children and allows educators to get to know children and families beyond their room. As part of River Garden’s multi-age focus, their recently acquired fish tank was placed in the babies’ area and the three year olds have been helping the babies clean and maintain the tank. It’s all hands on deck at the centre! This state-of-the-art childcare centre in Melbourne features beautifully designed open plan spaces rich with resources and areas for learning. With an outdoor space complete with gardens and areas for water play, and brightly lit interiors, River Garden provides a perfect place for children to grow. To learn more about River Garden or to book a tour, head here.